Early, early rise and shine! Good Luck Daddy! FREE counselling, nutrition advice, and homeopathic therapy support. We all know that fear is more imagination than reality. At least that is what I thought early Friday morning as I arrived at the York House to meet up with the rest of the riders to start our 3-day, 244 mile adventure to Paris. Upon arrival, my eyes only saw 20-somethings with perfectly fit bodies ready to ride me into the ground. They were the Olympians training for next year’s summer London games. However, once I cleared my contact lenses and took a deep breath to regain my confidence, I realised it was Neil, my fellow 45-something rider who looked just as good as me (and Borat) in spandex. As Neil went on with his Borat imitation, Nancy and Suzanne finally arrived looking as fit as ever. As Nancy rolled her eyes at her husband in full Borat form, accent and all, she reminded us why the four of us were here this day – to ride for Alex, my wife, as team AWBWC. While these are my wife’s initials (remember she’s from Texas where everything is big including her name), it also stands for Amazing Women Beating Women’s Cancers – something we made up in her honour. And we were raising money and awareness for her charity, The Haven, a Breast Cancer Centre located in London that supports women with breast cancer that both Alex and Suzanne are actively involved. As we proudly donned our Team Alex/AWBWC hats, I really wished she was riding with us this year, as every time I am overcome with fear I can only say one thing – Ahhh-lllllllllll-eeeeexx. And this was one of those moments. It really started to sink in that I was doing this ride without my wife, my trusted confident that I had asked so many questions about cycling, nearly every day for the past four months. There was one question, however, I never asked her. “HOW DO I and WHERE DO I apply the chamois cream to protect my bum?” To avoid asking my fellow riders such an embarrassing (and revealing) question I quickly and quietly texted Danny Z, my own trainer, this very last, but important question. As I awaited his answer, I realized the more I applied the more confident I became, so what the heck. But leave it to the women to get the answer more efficiently. Suzanne made the simple declaration after reading the directions on the tube (who would have thunk to do that and look there? ), “You put the cream on the chamois pad, Jeff.” Oops too late! Now it was time for the broader group of 40 plus riders to divide up into 4 teams by skill level. Suzanne argued for the pro-athlete group (what was she thinking? ), while I begged that we go with the group that thought riding your bike once to work for a total of 3 miles was sufficient training – my kind of people I thought. But somehow Neil, a.k.a. Borat, in his reminiscing about athleticism in the “old country” landed the two of us in the second fastest team – a bunch of really fit people wearing “Skiddles” jerseys, yes the candy which usually isn’t synonymous with fit. But please remember that this was the marketing management team from Wrigley, and by the end of the first day, I was convinced that I would ride like superman if I ate Skiddles, Mars Bars, and of course my favourite, Starbursts. Although it seemed like an eternity, the hour hand finally reached 9am, and we were off. Each day the ride was composed of three stops, a tea break, lunch and an afternoon tea break before the last leg. Some how this structure seemed to create confusion like a trick question on a school entrance exam – Neil (and others to give him credit) thought that if we were doing 71 miles this day it would be 23.6 miles to the first stop if we had three stops. News alert, you must include the last stop, so it is 17.7 miles to the first stop – and to think Neil passed his LSAT, even in the 95th percentile – well, that’s a New York City attorney for you! As we first started to ride, I felt held back by all of these inferior athletes around me. Little did I know it was the London rush hour traffic that was holding us all back. Once it opened up, the inferiors left me in the dust. And when my teammates, including Neil, disappeared over the hills, I soon learned what Alex had warned me about for over a year – the word “undulating!” Yes undulating is something you experience. You don’t learn it from a dictionary. The first tea break didn’t come fast enough. And some how the slower team, that both Nancy and Suzanne were in, beat us to the first tea break. I assumed it was my pitiful performance that was holding back our team, so I made one last plea to the team leaders to join the slowest team. However, I was soon informed that the slowest team had already left and that the slowest teams go first, which is why the ladies had beat us, and the fastest team goes last. That does makes a lot of sense – and to think I have a PhD. That’s a London economist for you. As we set off on the second leg, the one thing I did know is that the undulation was only between London and Portsmouth on the English Channel where we would catch the ferry, so I just had to survive the next ¾ of a day. As the pain from the undulating hills set in, our guide got lost and we did a few extra undulating hills. It sounds funny as I write it, but let me tell you with 40 miles on the odometer, two extra hills pushed a few swear words out of my mouth. But let me tell you, while I hated Mikey, our trusted guide, at that moment, by the next day he was more than forgiven – he truly was our archangel, sent by God. At lunch I learned an important lesson – we weren’t staying at a leisure resort with lots of time to kill and service everywhere. As I dismounted my bike, I felt the need to call into the office, get the market report, chat up a few mates and waste a lot of time pretending that my office cannot function without me. Well by the time I hung up and went for lunch, it was all gone, yes I had waited too long. Oh my god, I thought, I have to fend for myself – as I slurped down a left over rice pudding, my teammates learned a little trait of mine (that many of you already know) – I AM A TIME-SHAVER, not saver. My team were already on their bikes ready to go yelling at me, “come on Jeff, we have to go. “ It was to become a feature of the trip. I always had some problem that made me a few minutes late. This time it was my glove – it was on inside out. In grand fashion, the end of the first day’s ride was capped with the mother of all hills. Neil claims it was 23 degrees according to a Garman. That day there was only one superstar, and it was Suzanne, who pedalled all the way to the top. Neil jumped off first at the halfway point to walk, once he did that, it was then cool for me to jump off too – whew thank god I didn’t jump first. In contrast to the men, Nancy gave it her best. She rode nearly to the top of the hill and was determined not to get off the bike, but as she ran out of steam she simply fell over into a grassy knoll near the top. She gave it her best, but did we feel embarrassed. Of course not, we are guys, and guys have no tolerance for pain. 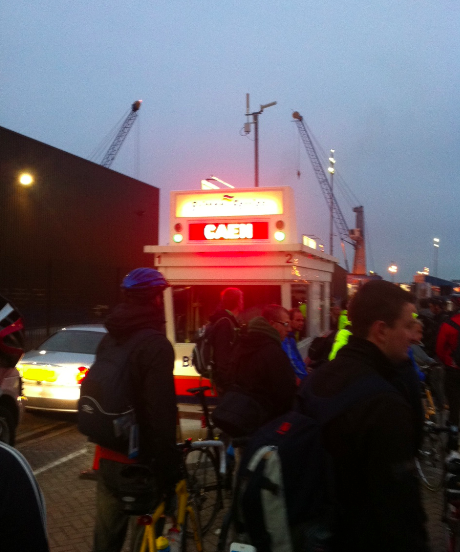 As we approached the ferry at the end of the day, my exhaustion was extreme and I even scared my teammates. I fell over simply walking my bike across a sky bridge. I couldn’t even walk let alone ride. So just how was I going to make it through the next 2 days. How? 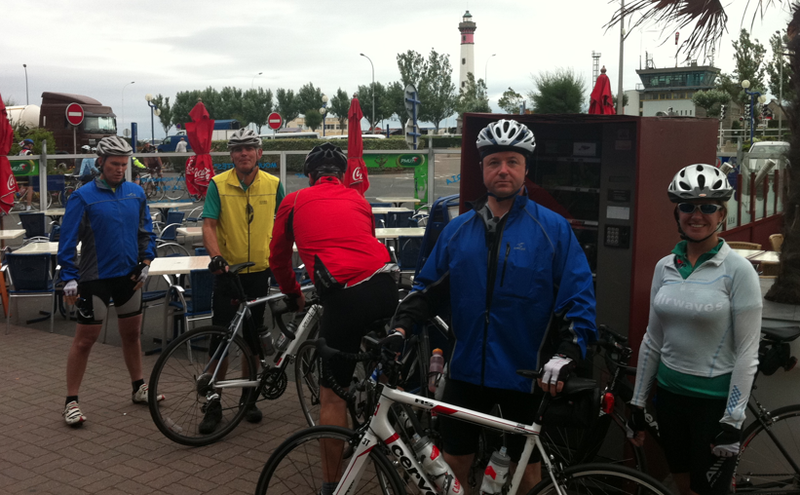 Particularly given that that night’s sleep was going to be on a rocking ferry crossing the channel. Soon we boarded the ferry alongside the cars, it was an overnight 7-hour trip. The biggest fear wasn’t the waves, but rather a snoring nodder as we were bunking 4 to a cabin. Luckily, I didn’t hear any snorers, but I could have been one of the snorers and never known it given the coma I was in. But somehow I woke up at 4:45 am that next morning bright eyed and bushy tailed. As the Normandy coast appeared on the horizon, I went to the boat’s galley for a coffee and watched completely alone the sunrise as we approached France. The one thing Alex and I have shared since her diagnosis last October is the early mornings – coffee at the crack of dawn has replaced the midnight nightcap. And I have to say, I actually prefer the super early mornings, as they are the only true quiet times of the day, as even revellers are asleep. And there were plenty revellers on this boat as it was equipped with a disco, but I never heard a peep. there are no other countries in the EU that have maintained their culture as France has, therefore the proclamation! Think about it, it is actually profound. After more Baguette and Café Au Lait, we start the second day with a boost. Alex asked me to take some action photos of people riding. I interpreted that as taking photos while I was riding, and as some of you know, that is the one thing I can do well, is shoot and drive at the same time. It may be dangerous, but I did get her photo. As the day progressed, somehow I found new strength that I didn’t know I had. I personally think it was the lack of undulation, but let me kid myself into thinking that I could actually keep up with my teammates. But most importantly, now that I could ride with them, we could do many team enhancing exercises, like a peloton (riding in formation to reduce wind which allows the team to go faster) or drafting, but most important, I had conversations with people other than myself. It was a whole new world. Ultimately, what I learned this day, was the power of teamwork, and I really mean it. The Wrigley management team that I rode with wasn’t there to have fun as I initially thought. They were there to build team skills. Riding in a peloton requires everyone to pull his own weight, particularly when you have to lead. I couldn’t be a laggard anymore. I had to keep up. I had to lead. I had to be a part of a team. Soon Neil and I started to metamorphous into our teammates. It started with me. On day two they wore their Airwaves chewing gum jerseys, which were green. When I shed my coat that day, Neil was shocked to see that I was wearing a green jersey. Team AWBWC was now looking more and more like Team Wrigley. However, this didn’t stop Neil from committing the gravest of errors – pulling out a bag of Cadbury gummies, Jelly Babies, from the competition! He learned his lesson and returned back to Skiddles and Mars bars. But what I also learned on that break that day – I HATE SPORTS DRINKS AND THOSE SICKENING ENERGY BARS. I literally tossed my stash of energy bars into the woods (wrapper off of course) and most importantly, I realised that I preferred Skiddles and Mars bars washed down with Coca Cola – the energy for champions. I swear it works better! And it tastes better! I was told of scientific studies that Coke is actually better than the sports drinks. But just as my new sugar rush was kicking in, I encountered my first big hill for the day. Believe it or not, it coincided with a sign delineating the real Tour de France route. 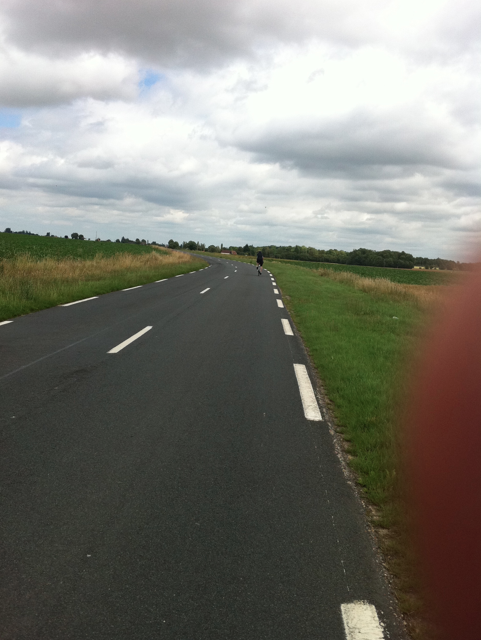 This was one of those moments where you pinch yourself and ask am I really here riding in France along the TdF route? You will note that I don’t have a picture of this (Team Wrigley does by the way). The reason being I was beginning to lag, so I didn’t have time to stop. What was sad about my inability to take photos was that this stretch was the most beautiful of the ride. Alex asked me to take pictures, but I was holding my team back and if I stopped it could cost us 15-20 minutes against our rivals (we couldn’t let that happen now could we). 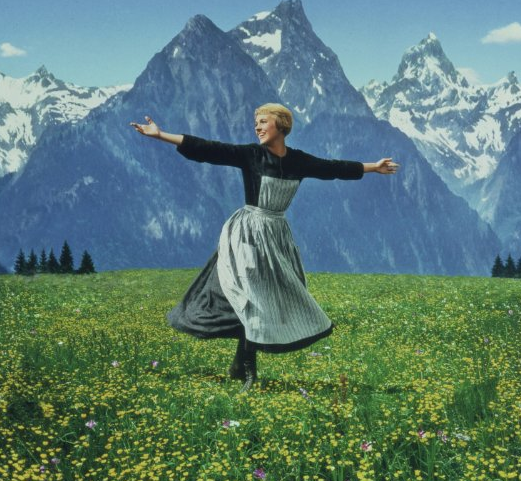 But let me tell you, it truly looked like it was out of The Sound of Music, yes I know it was Normandy and not the Austrian Alps, but the grass was so green and the hills were covered with white sheep – absolutely stunning and it is ingrained in my head for life. Lunch came very soon for our team, as we were making the best time of the four groups that day. It was all teamwork, drafting and pelotons, which allowed us to move so fast. 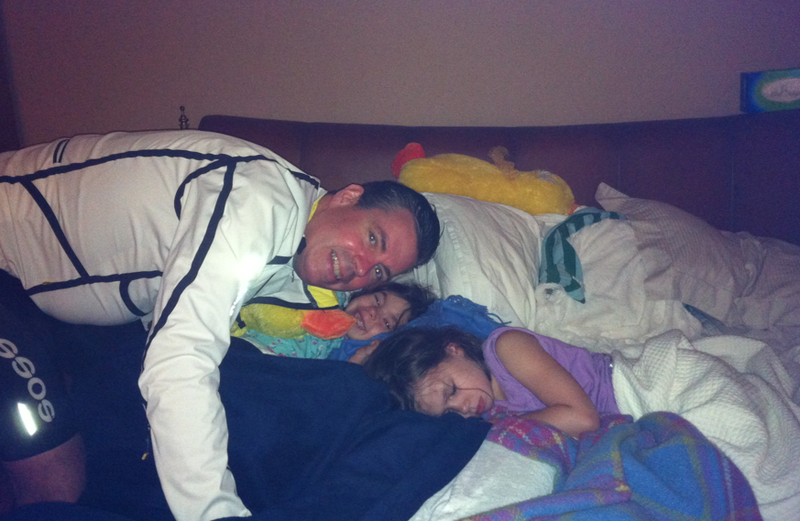 Lunch was quick this time, no phone calls, only food, a cat nap to rest and water – all in less than 30 minutes. We were making such good time that we were off as the next team arrived for lunch. The competitive side was emerging in all of us at this point – no one can catch us. The afternoon ride was simply stunning – great weather, great scenery, great teamwork, which all led to one of the most exhilarating days of my life. As a team we were moving at a 26 mile-per-hour clip for long periods of time across the rolling French plains – I truly felt like I was riding in the Tour de France. This is where Mikey, our guide, really shined. 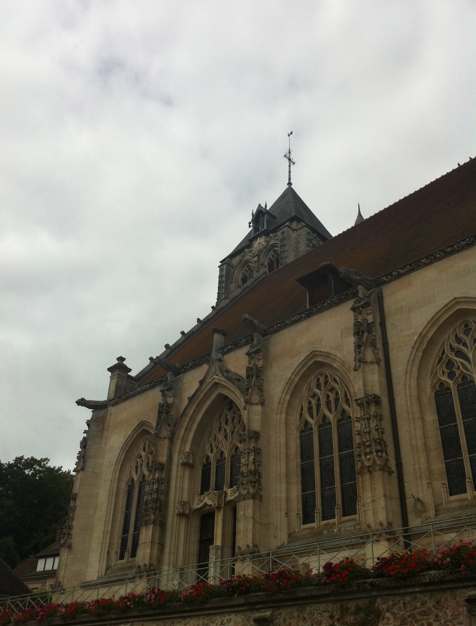 He guided us perfectly for a spectacular tour of Normandy – no wrong turns, just a perfect day. 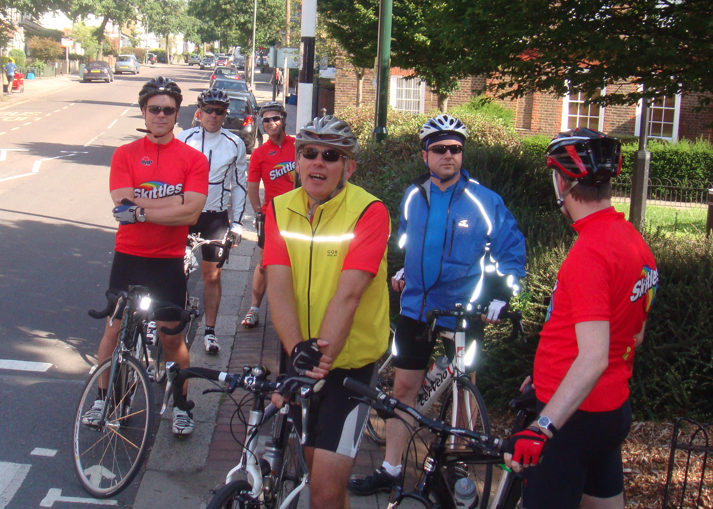 We knocked out 97 miles that day in lightening speed – worthy of a yellow jersey. To put this into perspective, we arrived at the hotel 2.5 hours before the next team. From this, I learned an important but obvious lesson – the fit get fitter. By arriving early, we got more rest, more food and just felt way better. But I owe this to my teammates again for pushing me – I did something that day I have never done before – I was in top form for something physical! I not only survived, but I excelled. This is strange for someone that for his whole life has simply survived physical activity. It really has changed my view and outlook on life and how I should treat my body – the fit get fitter. The next morning was the last of the trip and a melancholy set in briefly until Team AWBWC fully morphed into Team Wrigley. We all donned guess what coloured jerseys? 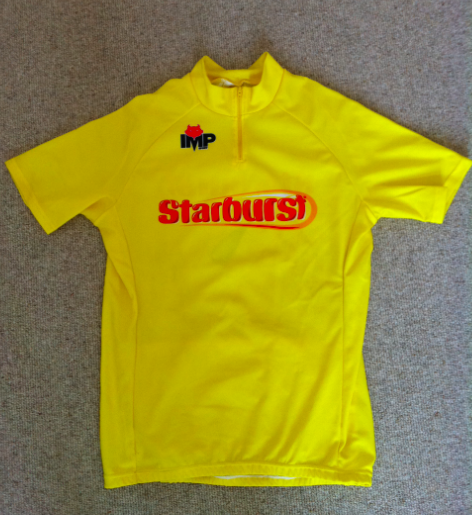 Yes YELLOW, but of the Starburst variety. 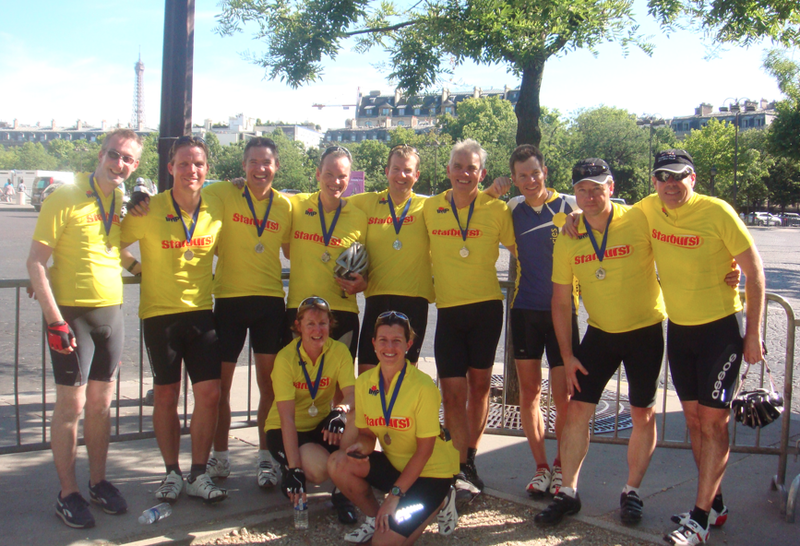 We were now one team – AWBWC/Wrigley – in the most French of cyclist colours! We departed that morning in a real competition with the other teams. 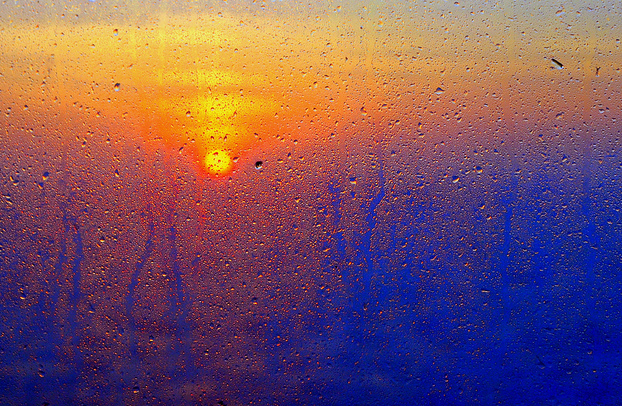 It was a roaring start to the morning – our time was the best of the trip. Then disaster struck. Fix my tire Mikey, pretty please! It was a snake sound coming down a hill at 35 mph – Neil blew a tire. Neil has a habit of always getting into an equipment problem every time I go anywhere with him and this trip was no exception. But Mikey, once again saved the day, he changed that tire like Lightening McQueen’s Italian pit crew on Cars – so fast we were back on the road gaining time. But eventually our luck ran out – flat tire after flat tire – Neil had three and Mikey had one. Law 10: Infection: avoid the unhappy and unlucky. Law 10 got the best of us (sorry Neil) and sure enough, Nancy and Suzanne went pedalling past us at a very comfortable and leisurely pace. Despite our connection with the yellow jersey, I abandoned the unhappy and unlucky Neil and associated with the happy and fortunate Nancy and Suzanne. 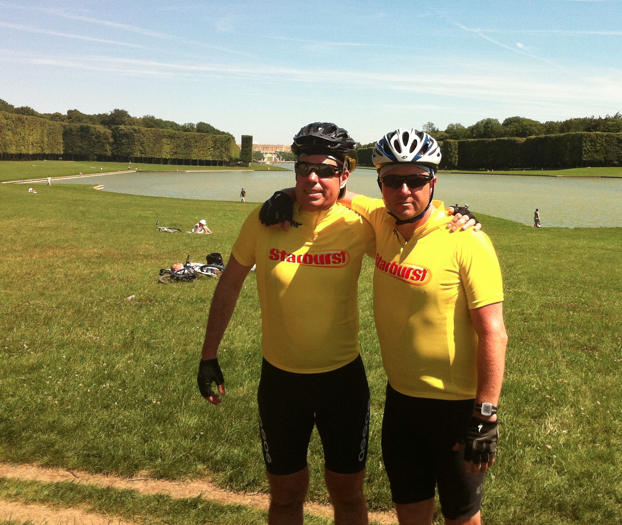 And with them we pedalled toward the Palace of Versaille. Neil, accompanied by our archangel Mikey, finally rejoined us as we approached the Palace. We entered from the back where the reflecting pools extend over a mile from the back of the Chateau. We traversed the entire gardens of the palace. Luckily, at a slow pace so I snapped a lot of photos – finally! Next was Paris! Mikey informed us we only had one hill in front of us and after that the last 12 miles were entirely downhill into Paris. But this last hill was a real doosey – straight up. Because we all knew it was the last, no one dismounted their bike. Paris ou Buste! As we entered the city, the pace slowed with the traffic and the reality that the trip was over overwhelmed me more than the site of the Arc de Triomphe – our final destination. I had spent 4 months training for these three days, it was the most challenging physical accomplishment of my life. All I could think of is can we keep pedalling towards the Cote d’Azur – I don’t want it to end. But it did end with the world’s most wonderful sight – the first wonder of the world – my family – Alex, Shepherd, Carsen and Ewan who were joined by our finest friends – the Luchs – all four of them – Beth, Bryan, Winston and Penelope! If it weren’t for Alex and my family’s love and encouragement, I wouldn’t have been standing there underneath one of the other lesser wonders of the world. Here is to team AWBWC for successfully completing the challenge for Alex, The Haven and all Amazing Women Beating Women’s Cancers! Cheers – we made it! 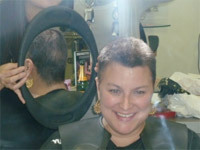 This entry was posted in ALL POSTS, Chapters in Treatment, Doctors Orders, Heroes In My Book, Landmarks, The Big Events and tagged Pink Pom-Pom Project, stayabreast blog, The Haven Breast Cancer Support. Bookmark the permalink. I am so inspired that Jeff completed such a physical task. Thanks for sharing your story! CONGRATS!! AND THANKS FOR THE PLAY BY PLAY – I FELT I WAS RIGHT THERE WITH YOU – SANS THE SORE BUM! Congratulations to you all! We are proud of you! Allez Alex, allez Jeff! It is funny that you spandex boys really did it! Love to all and congrats.